Let me preface this by saying I didn’t know anything at all about the tragedy that happened to the Marshall football team and community in 1970 until this film was released. Any way you look at the situation, it was a horrible nightmare that almost destroyed a community. We Are Marshall was made with the intention of bringing to light how that community was saved. The Movie Mind has a large soft spot for very few things: sad true stories, sad sports movies, and sad true sports movies. There were a number of moments in this film where your arm-hair stood up and you felt the emotions stirring inside. Unfortunately, there just weren’t enough of them. There is not one single moment in any film in existence that makes me well up with emotions more the instant that Rudy runs triumphantly onto the hallowed grounds of Notre Dame’s gridiron. You would think a movie about an entire time beating the odds, overcoming tremendous loss and sorrow, while inspiring an entire community would do the same for me as Rudy did…but it didn’t. First and foremost, I don’t buy McConaughey as a coach. Yeah, we all know he’s a die-hard Texas Longhorns fan and self-proclaimed football junkie, but he doesn’t fit the bill at all. He is much more believable as the cocky back-up QB who is a ladies-man and a drunk than a stand-up guy who only cares about football and his family. I don’t know much about the real Coach Jack Lengyel, but unless he was some kind of cartoon clown, he was done a huge injustice by McConaughey. Back in the day when this film was set, football coaches fit a lot more of the classic “dumb football coach” stereotype than they do now, but come on. McConaughey made this guy look like he would be happy if he could remember what sport he was coaching. Matthew Fox, on the other hand, playing assistant coach Red Dawson, fits the bill much more than his leading counterpart. Maybe some of it has to do with the fact that Fox was a former college football player at Columbia, but any way you look at it, he is just more believable in that role. There were a lot of statistical inaccuracies, which we gloss over to keep focus on the struggle of each character affected by the tragedy. One thing the writers did well was to show the vast reach of who was affected, portraying future Hall-of-Famer Bobby Bowden in a nice light. Still, part of my problem is that they did not pay enough homage to the fallen players, coaches, and boosters. It was sort of a back-story to the current struggles of the team trying to unite. Most of those issues are due to McConaughey’s inability to portray a character who we believe has the mental capacity to understand the deeper meaning of it all. Sure, he has some nice lines that claim he understands it all, but there is a big difference between saying it and proving it through your acting performance. It is a nice story on how the team finally came together for an unlikely victory which served as a sort of healing process for the town, but it just doesn’t do enough. 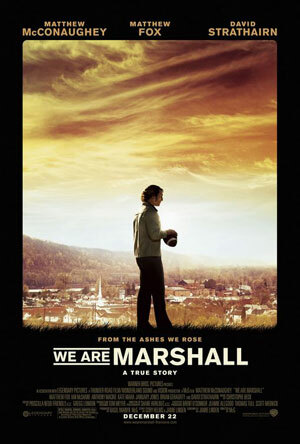 The writers failed miserably to show how all the new players following the tragedy fit into the lasting image and legacy of Marshall Football, which in my opinion, is what is missing from taking the movie from ordinary to extraordinary. Jack Lengyel: One day, not today, not tomorrow, not this season, probably not next season either but one day, you and I are gonna wake up and suddenly we’re gonna be like every other team in every other sport where winning is everything and nothing else matters. And when that day comes, well thats, thats when we’ll honor them. Jack Lengyel: When I heard about what had happened, your situation, the only thing I could think about was the four of them. I thought about how much they mean to me, about how bad it would hurt if… well if I was to lose them. Then I thought about a team, and a school, and a town thats gotta be hurtin’ real bad. And I thought, hell, maybe I could help. This is one where if you were from anywhere in the Virginia/West Virginia area…you may have felt the impact a little more. and unlike most of the movies you see these days about inspirational American football teams. These criticisms make no sense to me.